Bharatanatyam dancer Kavitha Ramu received the NADANAMAMANI award from Kartik Fine arts on the inauguration day of their annual festival in December. The award carries a medallion, cash of Rs.15, 000 and a citation. Brahma Gana Sabha conferred GANA PADMAM on Madurai N Krishnan, NATYA PADMAM on Chitra Visweswaran on December 3, 2003, the inaugural day of their dance and music festival. Shanmukananda Sabha, Mumbai conferred the NATIONAL EMINENCE AWARD FOR EMERGING ARTIST 2003 on Bharatanatyam dancer Urmila Sathyanarayanan on 6 December 2003. Nungambakkam Cultural Academy Trust conferred the title of NIRTHYA KALA SIROMANI on Bharatanatyam guru Saraswathi on the inaugural day function on December 10, 2003 at Rama Rao Kala Mantap. Bharat Kalachar conferred KALA SEVA BHARATHI on Radhika Shurajit and Manjula Lusti Narasimhan, YUVA KALA BHARATHI on Preethi Vasudevan, Archana Narayanamoorthy, (Bharatanatyam) and Suma Mani (All rounder – Bharatanatyam, nattuvangam and choreography), on December 12, 2003 at the YGP Auditorium, Chennai. To commemorate its golden Jubilee celebrations, the Krishna Gana Sabha, Chennai, conferred the title NRITYA CHOODAMANI on Narasimhachari and Vasanthalakshmi and ACHARYA CHOODAMANI on N S Jayalakshmi on December 12, 2003 at 5pm. Narada Gana Sabha conferred NADHABRAHMAM AWARD on C V Chandrasekhar at Sadguru Gnanananda Hall, Chennai on December 14, 2003. Krishnaveni Lakshmanan received this year's RUKMANI DEVI MEDAL, instituted by the Centre for Creative Dance, Delhi. The function was held at Bharatiya Vidya Bhavan on 19th Dec.2003. The SANGEET NATAK AKADEMI AWARDS given to eminent practitioners of music, dance, theatre and those who serve the arts will go to 33 awaredees for the year 2003. In dance, C K Balagopalan (Bharatanatyam), Sunayana Hazarilal and Urmila Nagar (Kathak), Sadanam Balakrishnan (Kathakali), Suryamukhi Devi and Kalavati Devi (Manipuri), Uma Rama Rao (Kuchipudi) and Harekrishna Behera (Odissi). Other awardees include Prabat Sharma and Leela Omchery (traditional and folk music), Balachandra Vyankatesh Pendharkar (natya sangeet), Banamali Maharana (Odissi music), Puran Bhatt (puppetry) and Koshakant Dev Goswami (mask making). P V Subramaniam (Subbudu) has been recognized for his overall contribution/ scholarship in performing arts. Scholar/critic Sunil Kothari has been elected as Vice President for World Dance Alliance Asia Pacific South Asia for the second term. Urmimala Sarkar Munshi has been elected Chapter Head of India. The next conference of World Dance Alliance will be held at Taiwan in July 2004. The Madhya Pradesh government conferred the KALIDAS SAMMMAN AWARD for the year 2003-2004 to Chennai based choreographer Chandralekha at a special function to be held in Bhopal on November 1, 2003. This prestigious award for the performing arts carries a citation and a cash award of Rs.1 lakh. Chandralekha is the 16th recipient. Bangalore based dancer B S Sunanda Devi was conferred the RAJYOTSAVA AWARD by Karnataka Chief Minister S M Krishna on the Kannada Rajyotsava Day November 1, 2003 at Rabindra Kalakshetra, Bangalore. The award carries with it a 20g gold medal, a citation, a shawl and a memento. The Karnataka State Govt confers Rajyotsava awards every year on personalities in recognition of their contribution to their respective fields in the Karnataka state. Sunanda Devi is a Kuchipudi dancer and a senior disciple of Guru Nataraja Ramakrishna. The Tamilnadu State Government KALAIMAMANI AWARDS in the field of Bharatanatyam were presented on November 25, 2003. For 2003: Thanjavur Rajalakshmi, G Lakshmi Rajam, KSR Aniruddha and Ramya Ramnarayan. For 2002: Krishnaveni Lakshman, Ananda Shankar Jayant, C V Chandrasekhar, Mannargudi N Sakthivadivel, C P Venkatesan, Yogam Santhanam, Melattur S Kumar. For 2001: Udipi Lakshminarayan, M V Narasimhachari and Vasanthalakshmi, Nellai D Kannan, T K Padmanabhan, C R Radha Badri. Veteran critic, musicologist, composer PV Subramaniam popularly known as Subbudu in the world of arts has been finally honoured by the Sangeet Natak Akademi with its prestigious award. The general council of SNA met in Chennai on 29 November and unanimously decided to bestow upon Subbudu its award for lifetime contribution to performing arts in India. Alarmel Valli received the NRITYA RATNA AWARD from the Coimbatore Kendra of Bharatiya Vidya Bhavan during their annual dance festival in October 2003. 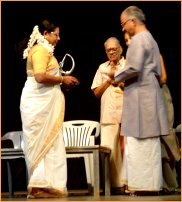 Shanta Dhananjayan received the KALASRESHTAA award from Kaladarpanam Art Magazine publications in Kochi on October 2, 2003. Hon Minister Kartikeyan will give away the award. On Oct 17, 2003, the 2nd annual Marga Festival conducted by Usha Vasanth Kumar and T B Unnikrishnan was inaugurated at Bharatiya Vidya Bhavan, Chennai. Mohiniattam exponent Kalamandalam Kshemavathy was honored by V P Dhananjayan. This was followed by a colorful Kathakali presentation Duryodhana Vadham by Kerala Kalamandalam. Rajeswari Sainath was the sole Indian classical dancer to represent India at the MELBOURNE ART FESTIVAL held in Oct 2003 at Australia. She performed INTO THE FIRE, accompanied by Carnatic musician Karaikudi Mani and members of the Sruti Laya Ensemble and the Australian Art Orchestra. Narada Gana Sabha's Natyarangam conducted its annual Bharatanatyam festival Kavya Bharatham from August 29 – September 2, 2003 in Chennai. The honors and endowments for the occasion– Bharatanatyam guru N S Jayalakshmi was honored, Bhagavatula Seetharama Sarma received the SUDHARANI RAGHUPATHY ENDOWMENT AWARD, senior Bharatanatyam dancer Roja Kannan received the OBUL REDDY ENDOWMENT AWARD and Bharatanatyam dancer Lavanya Ananth received the VASANTHALAKSHMI NARASIMHACHARI ENDOWMENT AWARD for Talent Promotion. Mumbai based dance school Kalasadan celebrated its Golden Jubilee with Suvarna Jayanthi Mahotsav on September 5 and 6, 2003 at Shanmukhananda Chandrasekhara Saraswati Auditorium. September 5 was also the 81st birthday of Guru Mani. The gurus honored on the inaugural day were Kalamandalam Raman Kutty Nair (Kathakali), Ustad Halim Zafar Khan (sitar maestro of Indore Gharana), Kanak Rele (Mohiniattam), L Lakpati Singh (scholar of Sankirtan), Korada Narasimha Rao (Kuchipudi Yakshagana), Rohini Bhate (Kathak), Sangeeta Vidwan K R Kedaranathan and Karunambal Govindaraj Pillai (present principal of Sri Rajarajeswari Bharatanatya Kala Mandir). Guru Mani was honored for his efforts to promote music and dance through his 50 year old institution Kalasadan. On September 21, 2003 on the concluding day of the 52nd Shivali Festival conducted by the Shivali Cultural Society of India at the Mysore Association Auditorium, Mumbai, Guru Rajee Narayan conferred the title of NRITYA SHIVALI on Padma Sampat Kumar (Delhi) for her outstanding contribution to Bharatanatyam. The GURU KELUCHARAN MOHAPATRA AWARD is given to a thespian in the field of dance, theatre, music or cinema because he has been involved in all these fields in the course of his illustrious career. For the year 2003, the award was given to Hemanta Das, a thespian of Oriya cinema, on September 21, 2003 on the last day of the 3-day festival held in Bhubaneswar. 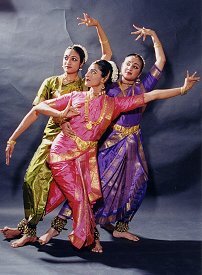 Chicago based Bharatanatyam dance company Natya Dance Theatre, received the prestigious CHICAGO DANCE AWARD. The award went to NDT artistic director Hema Rajagopalan and assistant artistic director Krithika Rajagopalan for their choreography of Ahimsa, an evening-length dance-drama on the subject of non-violence. This is the first time in its 17-year history that the award has gone to an Indian company, making it a milestone in the growth of Indian performing arts in the US. The Award to Natya was co-presented by Master of Ceremonies Harrison McEldowney and by the Indian Consul General in Chicago, Arun Kumar, in a ceremony on Monday, September 29, 2003 in Preston Bradley Hall of the Chicago Cultural Center. In Ecuador, the Astad Deboo Dance Company had five performances in the two festivals in Guayacil and in Quito, in September 2003. In Guayacil, they performed to a standing ovation to a record attendance of more than 1500 people. In Quito, the Astad Deboo Dance Company was announced as the best group performance. The other groups, which performed, were from Brazil, Bolivia, Columbia, Germany, Italy, Russia, Spain and USA. On the 56th anniversary of India's independence, The Week (August 17, 2003) publication has picked out 50 exceptionally talented young men and women who show great promise to achieve eminence in their respective fields. In the dance field, the chosen four are Vijayalakshmi Shivaji, Rani Khanam, Urmila Sathyanarayana and Rama Vaidyanathan. Santnu Chakraborty received the RASHTRIYA EKTA AWARD, for outstanding services, achievements and contributions in the field of Art, on the occasion of the 60th Birth Anniversary of Late Rajiv Gandhi on 19th August 2003 at the All India National Unity Conference, New Delhi. The second International Odissi Festival at Washington DC from August 28 to 31st was dedicated to the memory of Guru Pankajcharan Das. It brought together gurus, dancers and scholars of Odissi from America and India in a series of seminars and performances. On 1st July, the 2 volumes of her book 'KARANAS-COMMON DANCE CODES OF INDIA AND INDONESIA' were released by Murli M Joshi, Minister for HRD, Govt of India. On July 2nd, Jagmohan, Minister for Tourism and Culture, Govt of India, released 2 books by Padma Subrahmanyam. The fifth edition of BHARATAKALAI KOTPADU published by Vanathi Pathipakam and BHARATAKALA LAKSHANAM (Malayalam translation by Kalamandalam Sugandhi). Dubai based S Natarajan received the prestigious SANGEET NATAK AKADEMI AWARD for the year 2002 at a special function on 6th July at Nehru Centre, Worli, Mumbai, in recognition of 56 years of humble and diligent service for the cause of Bhagavata Mela, a rare temple/theatre art. Such a high honour for a Bhagavata Mela artist from the National Cultural body comes after a gap of 20 years. In the year 1983, late Sri G. Swaminathan, father of S. Natarajan was bestowed with the award. The award was presented by His Excellency, Dr.A.P.J. Abdul Kalam, President of India. On Monday, July 7, 2003, Dance View magazine (a quarterly review of dance published in Washington, D.C. since 1979) launched a new web site devoted to dance in the Bay Area: www.danceviewwest.com The site's content will include a calendar of upcoming events as well as previews, features and reviews by some of the Bay Area's best dance writers: Rita Felciano, Rachel Howard, Ann Murphy, and Paul Parish. More writers are expected to be added as the site develops. DanceViewWest.com will exist to offer thought-provoking, well-informed previews, reviews, features and occasional pieces on the area's wealth of dance activity, accessible on the Internet and available to everyone. There will be a community forum for the posting of announcements, press releases, and news, as well as for an exchange of views about performances. Dancers and audience members can exchange ideas in a virtual post-performance chat, and the forum will be open 24 hours a day, 7 days a week for that purpose. There is a plan to launch a sister site, DanceViewDC, in the fall to cover dance in the Washington, D.C. area. American Association of Indian Dance jointly with Aarti School of Indian dance, San Antonio (USA) has instituted an annual award and honour for an overseas artist who has contributed to the over all development and propagation of Indian classical performing arts and culture in North America. THE FIRST OVERSEAS NATYA AWARD-2003 was given to V.P.Dhananjayan and Shanta Dhananjayan for their lifetime contribution to Indian dance in the USA. This surprise announcement was made on the inaugural of the three-day National Asian Indian Dance Convention 2003 held in San Antonio on 18,19, and 20th July 2003 at the UTSA recital Hall of the University of Texas. Dhananjayan received this prestigious award from Chitra Visweswaran to a standing ovation. The function was presided by Dr. Dan Gelo (Dean, College of Liberal and Fine Arts, UTSA) and chief guest Mrs. Gracieta Cigarroa (Chairperson, Advisory Board, Premature Infant follow up programs). Mementos were also presented to eminent artists like M V. Narasimhachari, Ratna Kumar and Revathi Satyu in recognition of their services to the community. Kathak dancer Shila Mehta was awarded for her outstanding contribution to Indian dance. There were three days seminars, lecture demonstrations, works shops and performances of top class dancers from different disciplines of Indian classical dances. On the eve of its 18th anniversary, the Bangalore based Shantala Arts Academy presented its annual SHANTALA RANI AWARD to senior dance teacher T S Bhat on July 28, 2003 at the at Ravindra Kalakshetra, Bangalore. Amici is a unique dance theatre company integrating able-bodied and disabled artists and performers. Founded in 1980, Amici have had a major impact challenging conventional attitudes about disability and the arts. Wolfgang Stange is Artistic Director of Amici Dance Theatre Company. Shoba Natarajan, (founder of Sanskriti Foundation, Chicago, Illinois), received the PRESIDENTIAL SCHOLAR'S TEACHER AWARD on June 24, 2003 at the Kennedy Center for Performing Arts, Washington DC. Her student Uma Tadepalli of Durham, North Carolina, has been selected as one of 16 PRESIDENTIAL SCHOLARS IN THE ARTS for 2003. This is the second time this prestigious award has gone to a student of Indian dance. The 9 day NRITYA NAVARATRI MAHOTSAVAM in commemoration of the Diamond jubilee of Nrithyodaya and the golden jubilee of Padma Subrahmanyam's dance career was inaugurated on June 28, 2003 in Chennai at the Narada Gana Sabha. The Tamilnadu chief minister J Jayalalitha was the chief guest. She released the VISUAL ELUCIDATION volume of Padma's book 'Karanas-Common Dance Codes of India and Indonesia.' Padma Subrahmanyam's lifetime ambition has been to construct a temple in Tamilnadu for sage Bharata. Jayalalitha assured state help to Padma in her endeavour and asked her to identify a suitable site. The Therapeutic Arts Scheme - TAS - was established in the summer of 2002 by the charity, Waltham Forest Arts Council. TAS in Waltham Forest aims to substantially improve the emotional well-being of the 'whole' child using creativity and creative therapies as tools. They work with vulnerable children up to 11 years of age, from mainstream schools, who lack self esteem and children who are in crisis/at risk. Through creativity and creative arts therapy TAS creates a safe and consistent place where preventative work with children can happen and children can be supported to 'love, work and play' and hopefully flourish. At the valedictory function of Bhaaskara annual Gurukulam camp 2003 on May 17, 2003, the BHAASKARA AWARD 2003 (Natana-Bhaaskara) was conferred on A Janardanan (Retd Principal & Professor Emirate, Kalakshetra, Chennai ) and Kathakali Aasan Sadanam P V Balakrishnan (Principal, International Kathakali Centre New Delhi), two eminent and proud sons of Kerala. V P Dhananjayan, Founder and Managing Trustee of Bhaaskara felicitated the awardees. The function took place at Bhaaskara Campus auditorium, Near Kailasanatha Kshetram, Trikkutairi, Kaithapram between 4 to 6.30pm. Sri Lalithakala Academy Foundation Trust, Mysore conferred the title of LALITHAKALA RATNA on dancer / choreographer Anita Ratnam on May 25, 2003 during Natyanjali 2003, the birth centenary celebrations of Rukmini Devi. Sutra Dance Theatre presented 6TH ARTS FESTIVAL 2003 - SUTRARASA with artistic direction by Ramli Ibrahim from May 20th - June 22nd, 2003 MTC Jalan Ampang & Amphi-Sutra (Titiwangsa). This festival celebrated Sutra Dance Theatre's 20th year of existence and service to Malaysian Arts and coincided with Ramli's 50th birthday on 20th May. Sutrarasa 2003 focussed on mainly new ideas and creations in the field of contemporary dance and music for new choreographic and compositional ideas to emerge in dance and gamelan. The president of India presented PADMA VIBHUSHAN to Sonal Mansingh at an investiture ceremony held on Thursday the 3rd April 2003 at Rashtrapati Bhawan, New Delhi. Ramya Harishankar, the Artistic Director and choreographer for the Irvine based Arpana Dance Company received the OUTSTANDING ARTISTE OF THE YEAR 2002 AWARD from Arts Orange County, the non-profit umbrella arts council dedicated to developing, sustaining and promoting the arts and arts education throughout the county. It was presented at the gala 4th Annual Orange County Awards event held on April 10, 2003 at the Sutton Place Hotel in Newport Beach. Ramya received the award along with Raymond Kobler, a classical musician with the Pacific Symphony. "India International Centre, Delhi has received THE AWARD OF AMBASSADOR OF DIALOGUE, from Institute of Oriental Studies at Warsaw University in the category of 'International relations' for institutional contribution to promoting the idea of dialogue between civilizations, and in particular for the work pursued over many years to promote dialogue through arts, exchange of ideas and international contacts" - On behalf of the Chapter, Prof. Krzysztof M Byrski, Warsaw, 23 April, 2003. Rama Vaidyanathan received the SANSKRITI AWARD for dance instituted by Sanskriti Pratishtan on April 25, 2003 at New Delhi from dance critic Leela Venkataraman. The award carries a citation and a purse of Rs.20, 000. The inauguration of the Birth Centenary Celebrations of Rukmini Devi Arundale conducted by Kalakshetra Foundations, took place on March 1, 2003 at the Bharatha Kalakshetra Auditorium, Chennai. Dancer / choreographer Anita Ratnam received the NATYA RATNA AWARD from Sri Shanmukhananda Sangeeta Sabha on February 22, 2003 at Andhra Pradesh Bhavan, New Delhi, on the inaugural day of the sabha's Thyagaraja Music Festival. The Sabha conferred the title of NATYA ILAVARASI on Parvathi Ravi Ghantasala. Pt. Birju Maharaj was honoured with the title KATHAK SAMRAJYA CHAKRAVARTI by Shantananda Swami at the Sivaratri Festival organised by him, in Varanasi in February 2003. G Vidya Murty, Kuchipudi dancer from Visakhapatnam, and disciple of Smt. Bala Kondala Rao, received the MGR AWARD FOR THE BEST DANCER in the 15th "Spirit of Youth Festival of Music and Dance", from Music Academy, Chennai on January 1, 2003. The Music Academy, Chennai celebrated its Platinum Jubilee with a dance and music festival, which was inaugurated by the President of India. Sonal Mansingh was unanimously accepted as the best in the season of the Academy's dance programmes and the Academy presented her The BEST PERFORMANCE AWARD on 1st January 2003. Ammannur Chachu Chakyar Smaraka Gurukulam proudly presented its 16TH KUTIYATTAM FESTIVAL from the 1st to 12th January 2003 at Natanakairali, Irinjalakuda. Guru Hare Krishna Behera, founder president of Odissi Kendra, organised a 3-day festival of dance and music at Kamani Auditorium, from January 7 to 9, 2003 to celebrate 25 years of existence. There was also a seminar on 7th and 8th morning, on the evolution of Odissi down the ages, tracing its history from the Jagannath temple in Puri to its present form, taking into account the various sculptural, epigraphical and literary sources. The seminar took place at the Conference hall of Sahitya Akademi, Rabindra Bhawan. Kathak Kendra's annual KATHAK MAHOTSAVA, which took place at the Kamani Auditorium, New Delhi from January 10 – 14, 2003 was dedicated to LACHHU MAHARAJ because it was the 25th death anniversary of the Maharaj. Kuchipudi Dance Centre presented TARANGAM, a festival of Kuchipudi dance dedicated to the memory of the late scholar Dr. B Natarajan, on January 11, 2003 at New Delhi. Nalanda Dance Research Centre and Nehru centre jointly hosted a national seminar on dance titled INDIAN DANCE: A PAN INDIAN PERSPECTIVE, on the 11th, 12th, 13th and 14th January 2003 at the Hall of Harmony, Nehru Centre, Mumbai. The seminar was conducted as part of the celebrations to mark the occasion of start of the 30th year by Nalanda Dance Research Centre's Nalanda Nritya Kala Mahavidyalaya. The seminar addressed some of the major concerns facing the tradition of classical dances in India today. The subjects were Natya Shastric Tradition and Dance, The Philosophy of Aesthetics and its Impact on Indian Dance, The Evolution of Indian Dance and Other Arts, Religion and Dance, Literature and Dance, Music and Dance, The Influence of Geetagovinda on Indian Dance, History of Dance: A Pan Indian Perspective. 15 senior artistes and a Bidar institution Sangita Kalamandal, were conferred the KALASHRI AWARD instituted by the Karnataka Sangeeta Nritya Academy on January 19, 2003 at Hubli. J R Krishnaveni (dance), Sridevi Unni (Mohiniattam), Usha Datar (Sugama Sangeeta), Supriya Desai (Bharatanatyam and Kuchipudi) are some of the recipients. APPAN 5th INTERNATIONAL FESTIVAL - SYMPOSIUM on the theme of 'The sacred and the profane; the male and female role in Asian performance arts, monk / warriors for the male; geisha / devadasi / courtesan for the female; the transmission & transposition of the one to the other; the modern context' will be held on the banks of the Ganges, near the temple town of Rishikesh, from Jan 24th to 28th Jan, 2003. The following are the recipients of the Padma Awards announced on January 25, 2003. The highest of the three Padma awards, PADMA VIBHUSHAN has been conferred on Delhi based Odissi dancer Sonal Mansingh. Covering a wide spectrum of activities ranging from art to science and engineering, the prominent names for the PADMA BHUSHAN include Ammanur Madhava Chakyar (Kerala) for performing arts, Kuchipudi dancer Swapnasundari (New Delhi) and Bharatanatyam dancer Padma Subrahmanyam (Chennai) for classical dance, Madurai N Krishnan (Chennai) for Carnatic music. PADMA SHRI goes to Bharatanatyam dancer Malavika Sarukkai, Kshetrimayum Ongbi Thouranishabi Devi (Imphal), and Odissi dancer Ranjana Gauhar (New Delhi) for classical dance, Rita Ganguli (New Delhi) for art, music and dance. The Golden Jubilee Celebrations of the Sangeet Natak Akademi took place in the last week of January 2003 at the Siri Fort Auditorium, New Delhi. Bharatanatyam dancer Saroja Vaidyanathan received the NATYA SELVAM AWARD from organisation Muthamizh Peravai on January 28, 2003 at Bharatiya Vidya Bhavan, Chennai.